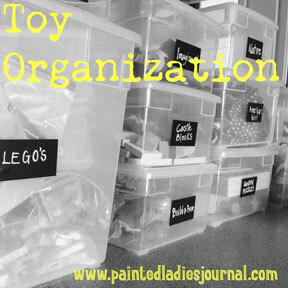 I did a guest blog post over at The Pocket Source yesterday on TOY ORGANIZATION. This was my second of three guest posts on organization I'm doing for them. The Pocket Source is a great community. Sign up for a free membership to participate on their blog, groups and gallery. I'm currently on their Creative Team which is so much fun. Toys. Toys. Toys. With 3 kids age 6 and under, we have a variety of toys in our house. And sometimes, they come with lots of parts. Currently, my three share a big room that has a small walk-in closet. When we first moved in, we fitted this closet with extra deep shelves (special order from Home Depot). I got rid of the hanging space, but fortunately I have plenty of that in my master bedroom closet to hang their nicer dress clothes. Almost all of their clothes are in dressers in their room. 1. Purge as much as you can. Donate, sell, just get it out. 2. Sort what you are keeping. 3. Evaluate size of containers you need for each item. I highly recommend The Container Store clear boxes with lids The best part of that store is you can order online for drive-up pick-up. Napping kid in the car? No worries, they bring it out. 4. Get labels. I am using chalk labels. These are great because you can erase and use them again and again. 5. Organize your boxes on the shelves. I've had this system for awhile now and it has grown/evolved as I went. Lids are key, and various sizes make it more efficient. I try to purge toys at every birthday and Christmas. Because my chalk labels are reusable, I can move items around in boxes that suit them and re-label them as our needs change. I also have some Land of Nod Strapping Cube Bins that I keep things in. As well as a couple of Room Essentials collapsible fabric storage bins that sit on the floor. One for dolls and one for stuffed animals. We keep all the kid board games in this closet, too. Note the binder on the same shelf. We keep most instructions in this binder, so they don't get lost. LABEL LOVE. I have two types of labels that I use in this closet: the chalk labels for the clear bin system that I already mentioned and these clip-on labels pictured below. These are name tag badges. I cut a piece of cardstock to size and then I wrapped them in washi tape. After that, I got out my handy labeler and printed black on white. I use black on clear for a lot of other things, but for this case black on white shows up no matter what the pattern background. I can clip these to both types of bins that I use.